When you open your browser after installing Dashlane you will see the shield icon in the toolbar. It will be outlined in the color teal (unless you use Safari, where the Dashlane icon will be dark gray, or Internet Explorer, where the extension will show a green dot). 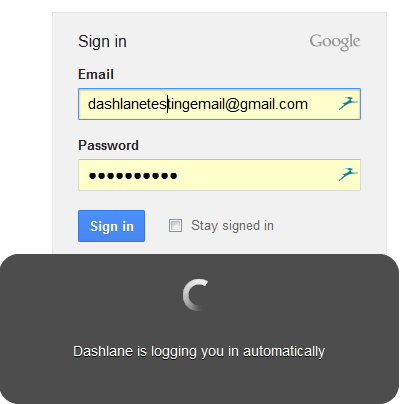 If you don't see this, then click here for more info about how to install your Dashlane browser extension. 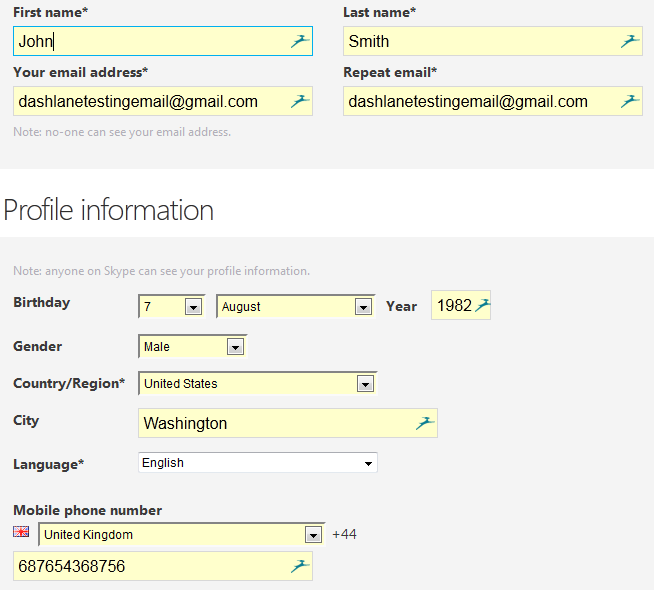 Dashlane also has the ability to log you into your accounts via HTTP Basic and Digest Authentication. 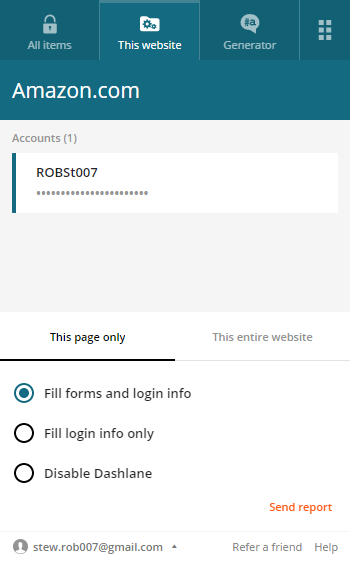 Simply enter and save your credential into Dashlane and Dashlane's autologin feature will log you in behind the scenes. Please note that this feature works best with only one credential saved per website and that the log in experience is invisible. Tired of filling in registration forms for every website you sign up for? Dashlane will do all the legwork for you! 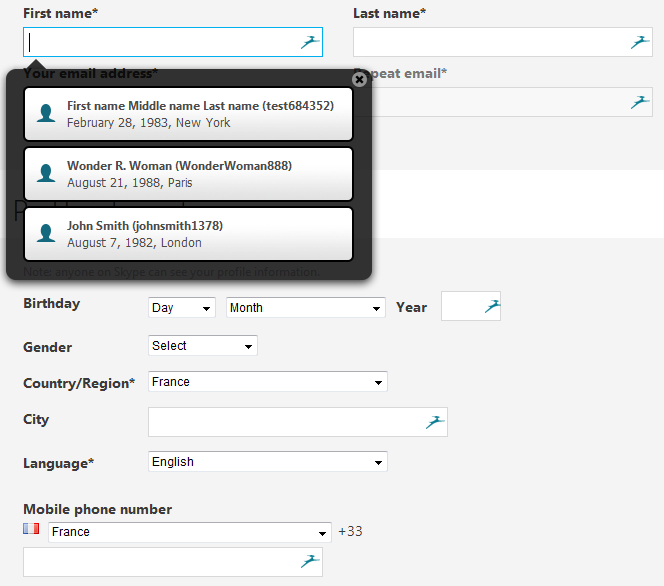 Simply click in a field and choose what information you want to use to fill out the form. 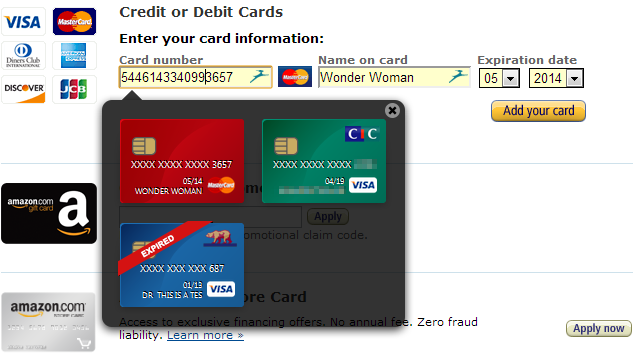 Click on one of these choices from the drop-down menu then Dashlane will automatically fill in the form for you. Dashlane lets you complete any purchase in seconds. 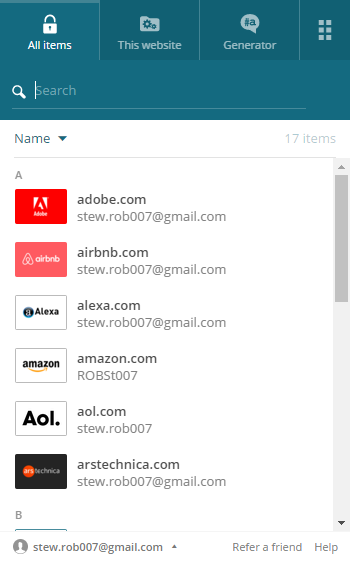 One of Dashlane's best features is the ability to automatically create and store unique and secure passwords. 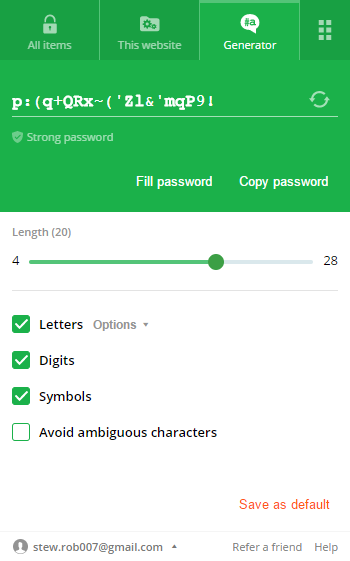 When you click in a field where you need to enter a new password, you will see a drop-down green box saying "Generate Strong Password". Click on this and we'll generate a password and save it for you so that whenever you return to this site in the future, you can use Dashlane to sign you in with a secure password, that you don't even need to remember. If you click on the Dashlane icon in your toolbar and go to the first tab, you will be able to see all the logins and passwords you have saved into Dashlane. Simply click on one of your credentials and you'll be redirected and logged in to this site. If you want to access the application, click on the More options button when hovering over your credential. The second tab provides you with options related to the website you are currently visiting. This tab allows you to disable Dashlane on a specific webpage or entire website and to report any issue you might notice in the extension (for instance if Dashlane does not fill a field on a particular webpage). The third tab allows you to generate strong password at any time you want. You can choose the desired length of the password, whether it will contain letters, numbers, symbols, and if you want it to be pronounceable so that you can remember it better. 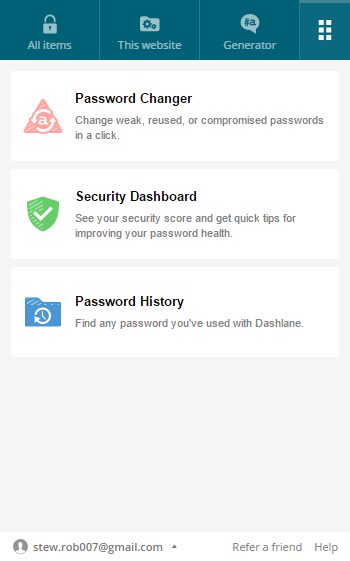 The fourth tab allows you to go directly to three features of Dashlane, Password Changer, the Security Dashboard, and the Password History. Note: The fourth tab is not yet available on Linux and Chromebook.